(Orlando, Florida) December 6, 2018 — The finest proof Morgan dollars set will be displayed by The PCGS Set Registry® (www.PCGS.com/setregistry) at the 2019 Florida United Numismatists convention for the first time anywhere in public. Known as the “Mr. Perfection 13” collection, the award-winning, 27-coin Morgan dollar basic proof set is 100 percent complete and has a rating of 69.47, according to Cosetta Robbins, Professional Coin Grading Service Set Registry Manager. 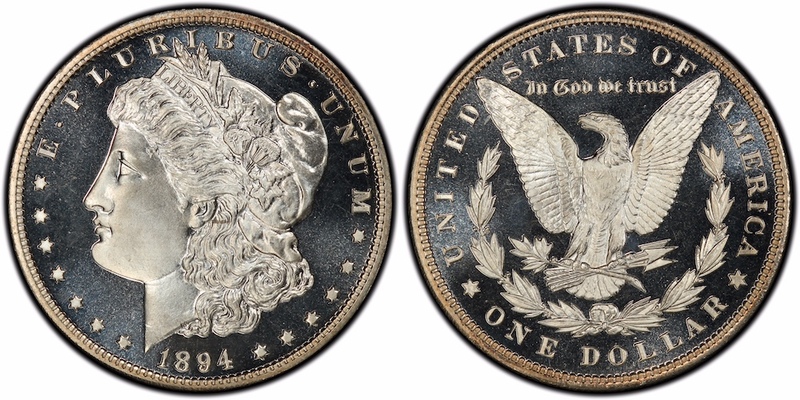 This 1894 silver dollar, graded PCGS PR68+DCAM, is one of the superb quality coins in the “Mr. Perfection 13” collection of proof Morgan dollars that will be publicly exhibited by the PCGS Set Registry® for the first time anywhere at the 2019 FUN convention. Photo credit: Professional Coin Grading Service (www.PCGS.com). 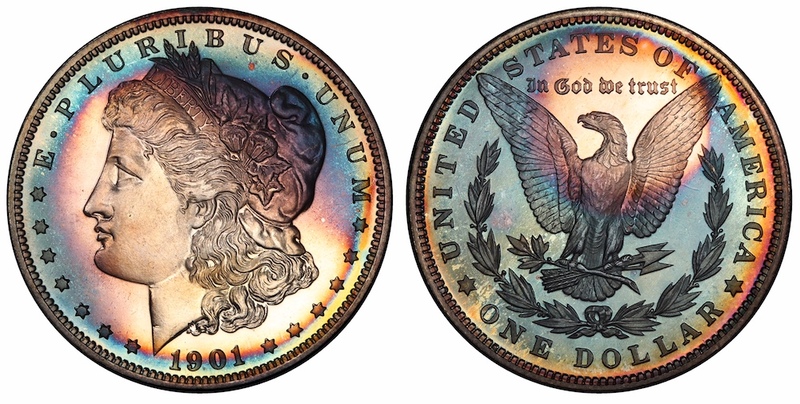 “Many of the coins in this collection are either cameo (CAM) or deep cameo (DCAM) proof, and some have amazing colorful toning. The anonymous owner of the set wants to share the remarkable beauty of these coins with visitors to the FUN show,” said Robbins. The finest proof Morgan dollar collection in the PCGS Set Registry®, including this 1889 silver dollar graded PCGS PR68CAM, will be displayed at the 2019 FUN convention. Photo credit: Professional Coin Grading Service (www.PCGS.com). The set will be displayed at the PCGS booth, #1203, from Thursday morning to early Saturday afternoon, January 10-12, 2019, at the FUN show in the Orange County Convention Center West Building in Orlando, Florida. Highlights of the “Mr. Perfection 13” proof Morgan dollar set include: 1880 graded PCGS PR68CAM, 1889 PCGS PR68CAM, 1894 PCGS PR68+DCAM, 1895 PCGS PR67+CAM, and 1901 PCGS PR68CAM. Never previously exhibited, the finest proof Morgan dollar collection in the PCGS Set Registry®, including this beautifully toned 1901 graded PCGS PR68CAM, will be displayed at the 2019 FUN convention. Photo credit: Professional Coin Grading Service (www.PCGS.com). The coin’s owner said, “This is one of my favorite sets.” In 2018 he upgraded three spectacular proof Morgan dollars: 1885 PCGS PR68CA, 1898 graded PCGS PR68DC, and 1899 PCGS PR67+DC. 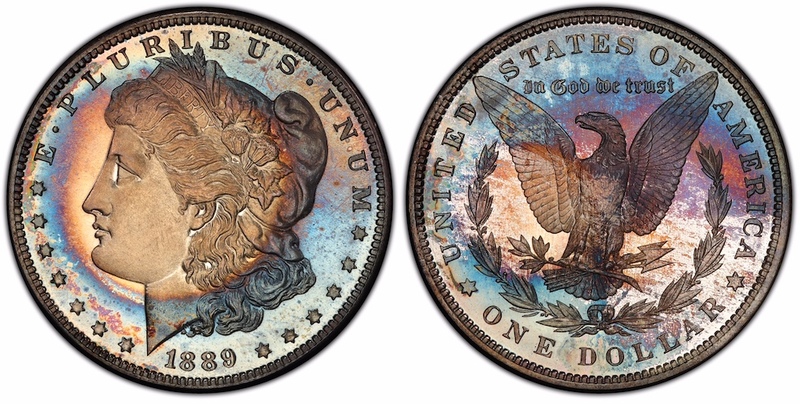 Information about each coin in the set is available online at https://www.pcgs.com/setregistry/dollars/morgan-dollars-major-sets/morgan-dollars-basic-set-proof-1878-1904/publishedset/109798. The PCGS Set Registry (www.PCGS.com/setregistry) was established in 2001 and now hosts over 94,000 U.S. and world coin sets. For additional information about PCGS and its services, visit www.PCGS.com or call PCGS Customer Service at (800) 447-8848.